To mark the centenary of the First World War, London Transport Museum is restoring one of the last surviving B-type buses to full working order. Once restored, Battle Bus will act as the centrepiece for a programme of commemorative events and displays. Plans include a recreation of the journey made by these buses from London to the battlefields of France. At home the bus will take part in a programme of community events involving London’s bus companies and garages. 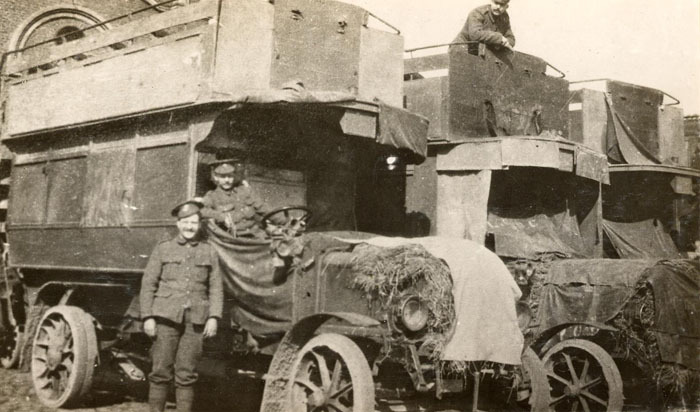 Over 1000 B-type buses were commandeered for transporting troops to and from the Western Front throughout the war. In often extremely hazardous conditions, civilian drivers manned buses protected by wooden boarding and painted khaki for camouflage. Known for their reliability before the war as London’s first successful mass-produced bus, the London General Omnibus Company B-type proved an ideal vehicle for such difficult work at the Front. Some buses were even converted into ambulances and pigeon lofts. London Transport Museum’s restoration project will tell the story of the unique contribution to the war effort by the Battle Bus, London bus drivers and their mechanics. It will also highlight the role of the bus in changing social perceptions, particularly towards women. For the first time, they were employed as conductors, clerks and cleaners as the men went away to the Front. The bus is being restored through the use of both original and replica parts and once completed will be covered in wooden boarding and painted in wartime khaki. It will be completed in time for the centenary of the outbreak of war in August 2014. The project will also comprise a five-year community learning and participation programme, including restoration apprenticeships and a volunteer scheme. Excellent news. Our group will be making a donation. If we can be of any use re our expertise on WW 1 matters – the National Trust amongst many other organisations use us – please have a look at our website. Two of our members are engineers with T4L on the underground by the way.